This entry was posted on April 4, 2019 by Chris Elliott. Herringbone hardwood flooring is actually the name given to a pattern made by parquet block flooring. Many people call parquet block flooring, herringbone flooring as that it the most popular design pattern that is made. Parquet blocks of flooring are much smaller than the normal planks. This allows you to create geometric patterns with your floor. Herringbone is the most distinctive and recognisable pattern created with parquet blocks. What does herringbone flooring look like? The herringbone pattern creates a ‘V’ shape. Each block of flooring is laid out at a 45-degree angle to the next. 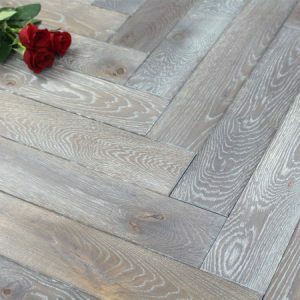 How do I look after Herringbone hardwood flooring? 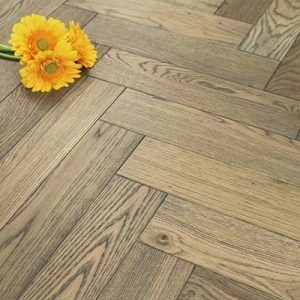 Looking after any type of wooden flooring is simple, and herringbone is no different. Once it has been installed you will want to keep it looking its best. Take care not to damage your herringbone floor. Always remove outdoor footwear before walking on the floor and wipe away spills straight away. We always recommend using felt protector pads on the bottom of furniture to prevent unwanted scratches. Cleaning is straight forward. First of all, sweep your floor with a soft brush on a regular basis. As a result, this will remove dust and dirt from the surface. Finally, clean your floor with a wooden floor cleaning solution and microfibre mop. We recommend using Bona Spray Mop. Furthermore, if you want additional advice on caring for your floor, have a look at our Maintenance and Care Guide.